While this site is about the Sitka Local Foods Network and projects in Sitka promoting local foods, occasionally we have news from a nearby community that’s worth reporting. 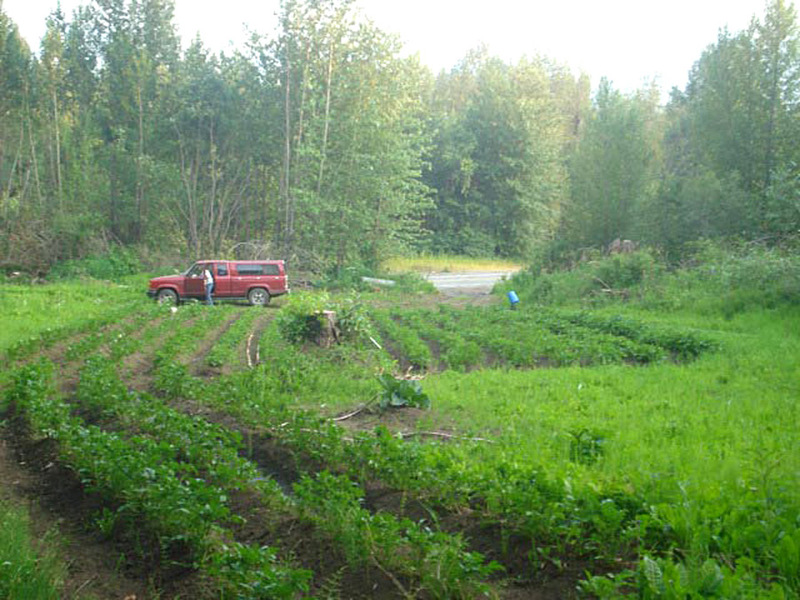 This summer, the new WISEGUYS men’s health group in Klukwan, a Tlingít community just north of Haines, decided to build a potato patch to raise potatoes and a few other vegetables for community members of the Chilkat Indian Village. 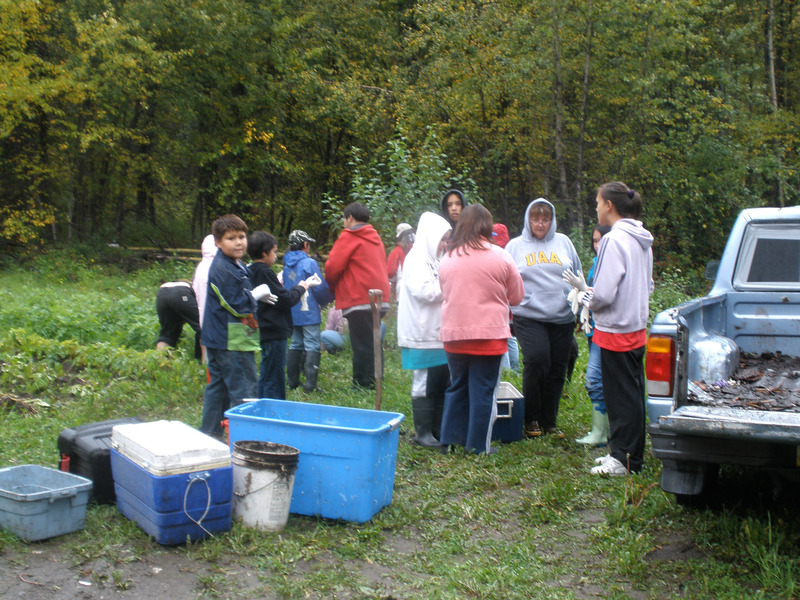 Adams said the group started with a donated piece of land from the Chilkat Indian Village and began clearing it of debris and cleaning it up so the ground could be tilled for planting. The WISEGUYS received funding from the SEARHC WISEWOMAN Women’s Health Program so they could purchase the potato seed and fertilizer, and the SEARHC Behavioral Health Prevention Program (a program to educate youth about drug and alcohol abuse) bought a few hand tools. 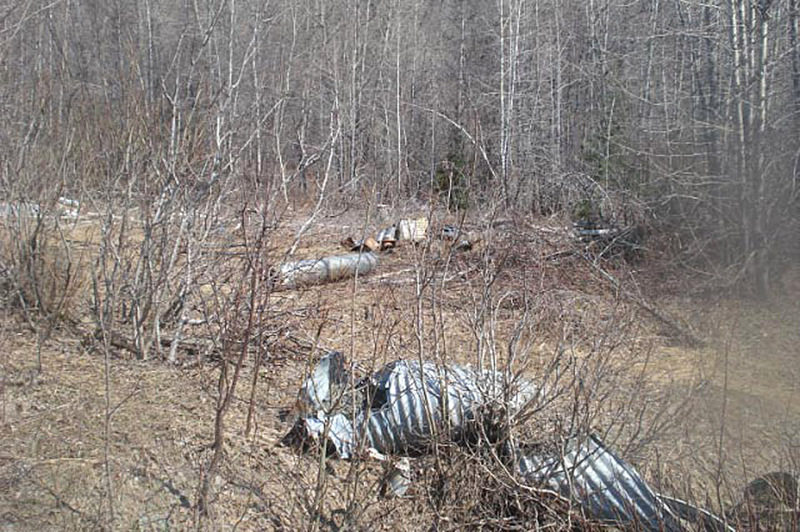 Sixty hours were spent in clearing and ground preparations, as well as 20 hours of donated heavy equipment time from Chilkat Indian village and Hank Jacquot. This got us to a 100-foot-by-100-foot piece of usable ground. The preparations for planting then began. Many of us spent several days with three Roto-Tillers tilling the area, digging furrows for planting, adding organic fertilizers and ultimately planting 1,000 potato plants. 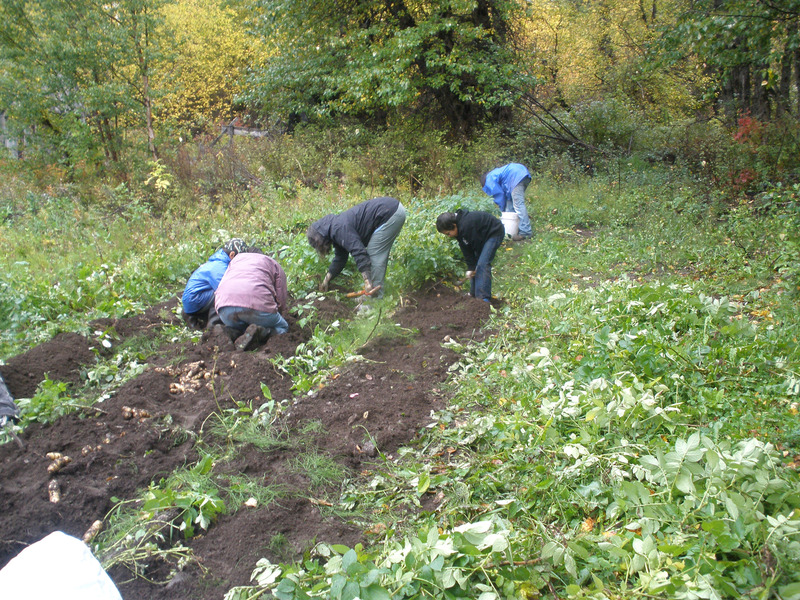 Four varieties were planted — Kennebec, Tlingít, Yukon Gold and Chippawa’s. The summer was unseasonably hot and there was a minimal water supply from a nearby creek. To supplement the creek, watering was done using the village fire truck to spray the patch with 750 gallons of water every three to five days. Adams said the WISEGUYS received a positive note when they applied for a small grant from RurAL CAP in August to purchase supplies and equipment, and they recently found out they were awarded the grant. He said the group plans to build a sprinkler system in the potato patch next year. 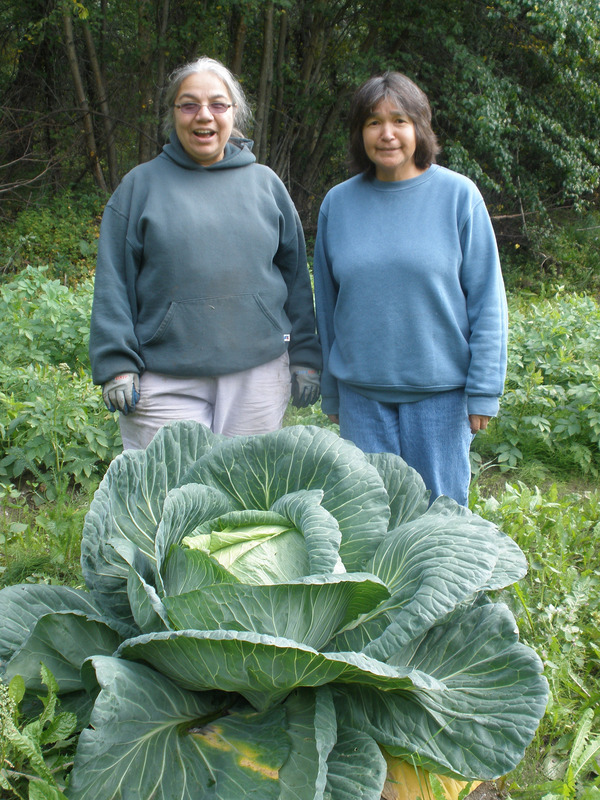 Lani Hotch and Bev Klanott stand behind a big cabbage growing at the WISEGUYS potato patch in Klukwan. The cabbage weighed nearly 30 pounds when it was harvested. 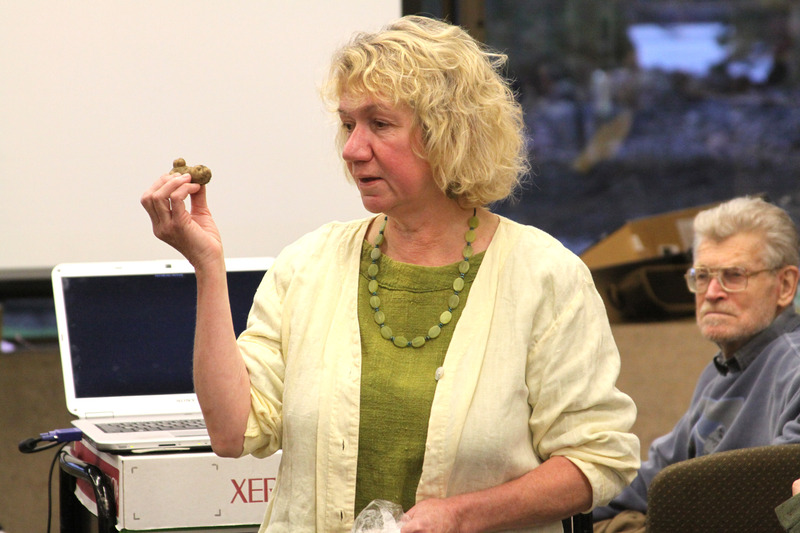 On Friday afternoon, the Sitka Local Foods Network hosted anthropology student Elizabeth Kunibe of Juneau for a presentation, “Growing in Sitka and Southeast Alaska: Food of Today, Tomorrow and 200 Years Ago.” This presentation took place at the Kettleson Memorial Library and we had a standing-room-only crowd of 50-plus, despite being arranged less than a week before the event and competing with several Alaska Day happenings. The Sitka Local Foods Network thanks Elizabeth for taking the time to make the presentation on what, for her, was a pleasure trip to Sitka for Alaska Day. We also thank the library and librarian Sarah Jones for allowing us to use Kettleson Memorial Library for the presentation. 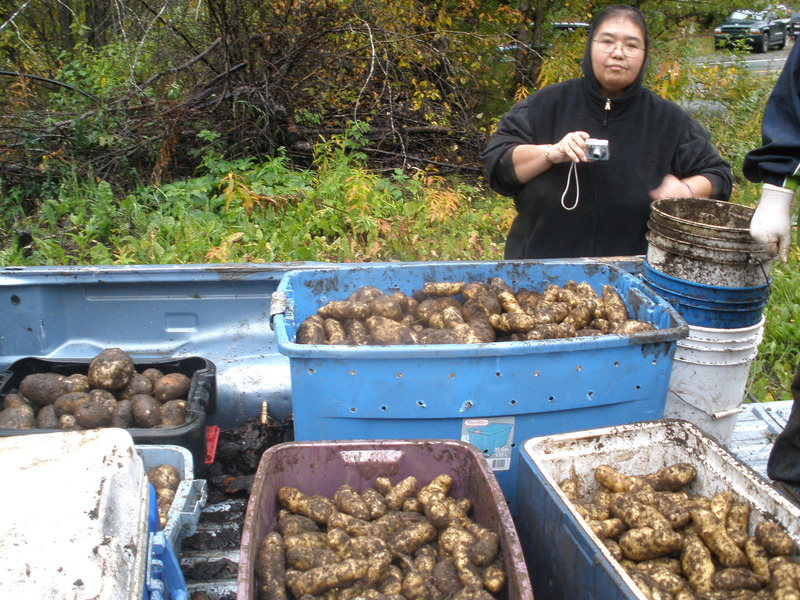 Finally, we thank everybody who came to the presentation to hear Elizabeth discuss traditional Tlingít, Russian and American gardens in Sitka and Southeast Alaska, the Tlingít and Haida potatoes, an agricultural fair in Fort Yukon, the phytonutrients of potatoes and plant diseases. For those people who weren’t able to attend, the presentation was recorded and it will be aired at various times this week on public access TV (Channel 11). Elizabeth said she might send over some notes from the presentation, and when those arrive they will be posted on the Sitka Local Foods Network site, http://www.sitkalocalfoodsnetwork.org/. A small gallery of photos from the presentation is posted at this link.